Both online courses are based on the books by the same name. Each course offers text, audio, and videos based on the content found in the books. In the WALKING LEADER Course, I dive deeper into what it means to be a Walking Leader, why take the Walking Leader approach to Managing By Walking Around and explain in greater detail what the 20 rules are and how to apply them in your personal and professional life. These courses are designed to be completed at your pace. UPDATE: MARCH 2019 – As I am migrating from the Teachable(dot)com website I am offering the courses at a greatly reduced rate. This is a limited time offer before prices return to their former Teachable price. 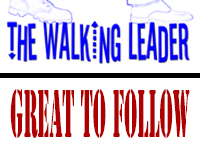 At this time, the WALKING LEADER course is currently accepting/enrolling students. • GREAT TO FOLLOW Online Course information coming soon!